Things I would have changed: Nothing . What others should know: I have mine on a Diana 56, I've gone thru maybe 1500 rounds . And the scope still works great. Yes the scope is heavy , but so is the gun. Around 13 plus lbs. Its a bench shooter not a carry gun. Things I liked: I'm really impressed with this scope. Lens caps, clarity, and adjustments. The reticle is also impressive although I don't use the illuminated feature hold off or over is very distinct. What others should know: I would put this scope up against Leupold, Nikon, Vortex and others. It's very well worth the money. Things I liked: The flip up lens caps, Eye relief, Very clear glass. The etched glass amx reticle is nice and thin, making it easier to see smaller targets. The horizontal bars in the amx reticle really help with more places to accurately hold on target with changing range, if I'm not dialing the turrets. And most important, it tracks back to zero just like it should. And that's on a magnum springer. Things I would have changed: Personal preference, but reticle and turrets on the same page. If you have a miI reticle, mil turrets would be nice. What others should know: Quality is worth the price. This Airmax 30 sf is holding up on my hatsan 125 sniper vortex. It is still holding its zero with 1200 plus pellets. I'm glad I bought this scope. Things I liked: Great clear optics at all power ranges, probably more scope than the average person needs!! But sweet in all respects as far as I can tell!! Things I would have changed: After adjusting the rear lens to fit my vision the scope lens cover doesn't seem to be adjustable to be opened to fold on to the top of the tube as when wound all the way in as packed, I may be missing something though not that important I guess. What others should know: Cant use the rangefinder wheel on my new Air Arms S510 Ultimate sportier as it wont clear the 10 shot magazine. My mistake I should have thought of it before ordering but keep this in mind when ordering!! Things I liked: Excellent Scope. I first tried it on my Benjamin Marauder 25 cal. and had great results, then affixed it to my HW97K. I thought my UTG bug buster was OK at first, but it changed zero at times, this "BAD BOY" DID NOT CHANGE ZERO! 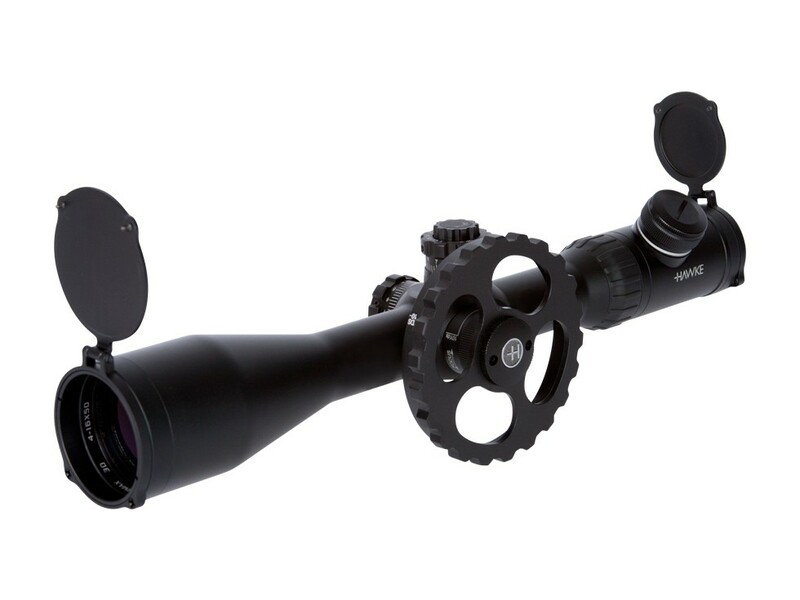 It is very consistant once zeroed and has very clear optics at most ranges. Things I would have changed: The turrets don't have a positive physical click when turned, and move when the turret is tightened. The Hawke Chairgun sofware isn't accurate with all types of ammo, perhaps this is just wishful thinking to expect it. Best thing is to sight it in, and record your shot drop physically at your own distance, elevation, humidity, and windage. What others should know: This is an excellent scope if you are using hold-over, but not if you are using the turrets to compensate for drop. The turrets are not "click-adjustable" enough to calculate windage or hold-over using click adjustments instead of hold-over. It is an excellent scope non-the-same. Other scopes by Hawke may be better suited for click-adjustment compensation for distance and windage. Just my opinion. Things I liked: Got one in 6x24 for my Condor and was so impressed with it I got this one for my BT65 I love these scopes!